"Thank you for being so inspiring and doing what you do with children. I have had a licensed daycare for 34 years and your session was my favorite." "One thing I can't get out of my head was when you said something like, "Childhood shouldn't be a race". Oh my gosh, I couldn't agree more! I LOVE how you use nursery rhymes and songs with your music. Thank you for reminding me that my job can be fun....What I learned about myself, was that I need to relax a little. You hit the nail on the head, for me, when you said 'sometimes you have to put that type A personality away, and let the wanderers wander'...You have re-inspired me. Thank you, thank you. THANK YOU!!!" "Thank you for what you do, clearly you have a wonderful gift. I am so glad that you share it widely so educators who attend your presentations may find new and wonderful ways to bring joy and learning to so many little ones out there. I have long understood and respected the power of music and am so happy to have your guidance, expertise, creativity and knowledge teach me. Never stop!!!" "Thank you for a wonderful morning of music for our students. It fit perfectly with our early childhood curriculum in so many ways- from the selection of repertoire, the props, the pop-up story book, the narration of the Ives and the holistic pedagogical approach. I have only heard fabulous comments from our teachers and students. You were both very well received by our DCDS community and we would love to have you back next year." "The hour long program was seamless. Gari deftly flowed from one song/activity element to another. The program held the attention of the young audience. Throughout the program Gari gave reassuring advice to the adults about the components of child development. She maintained a loving, accepting atmosphere as she kept structure in the event. She had segments where she introduced props like paper plates and scarves. These added another dimension to the activities. You could tell by the expressions on the participants' and by their body language that ALL were enjoying themselves. 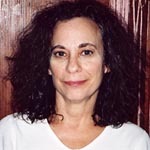 Gari Stein is a generous individual and a real pro in her field. I was fortunate to see how she implemented her philosophy, her knowledge of child development, and her techniques with regard to music and movement." "Fenton Area Public Schools World of Wonder Early Learning Programs brought Gari Stein in to help our staff with Professional Development in using music with preschoolers. We were very impressed with her presentation. It especially supported "Steady Beat" and utilizing music for transitions and to support brain development." 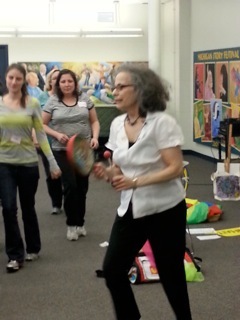 "Our families really enjoyed the Family Fun Night with Gari Stein. I was taking careful notes so that I could use her ideas for our own new "WonderWorks in Music' parent-child playgroups. So far I have incorporated Gari's ideas in our first 10sessions. I was very pleased to hear from one of our families that our new music program is in her opinion as superior in comparison to area commercial parent-child music programs. I could not have pulled this off with out the influence and teachings of Gari." 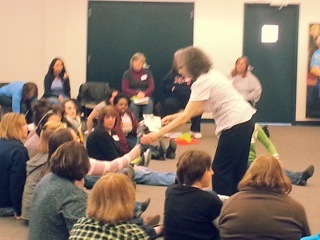 "Gari Stein presented a workshop for our library cooperative and was fantastic. She is so full of energy and great ideas! 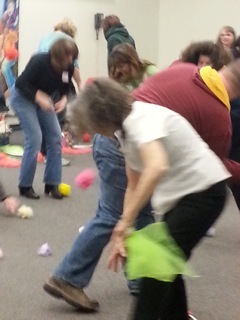 One participant commented "Gari was awesome! What great ideas! I'm excited to use these songs and movements." Everyone got a lot out of the workshop and had a lot of fun with it!" "I just talked with Jovina Coughlin at WISD and she said that her staff felt that your CD was even better than books for her population. They felt that for those who could not read well, it offered an easier opportunity to bond with their young ones." "I just have to tell you I am having so much fun with music - the class I was most nervous about teaching has become my absolute favorite... Thanks again for your encouragement and inspiration." "My center's weekly class is extremely boring compared to this...I am going to use music a lot more... I used to be afraid of music, but now I will try...informative & inspiring...Your materials really help me to do music everyday...It was very clear, it all fell into place...Everyone was really 'turned on' by your approach to early childhood...We have tried other music programs at our co-op but Gari's really stand out..."
"Activities I can really do with the toddlers... Even the big kids (1st & 2nd graders) love this stuff... A unique interactive approach to a school assembly... Everyone participated on some level... A perfect mix of music and movement... It was heartwarming to see young & old together in song and dance... Educationally appropriate and pure fun... The program provided a sense of community..."
One can have the best of materials, but without the confidence and skills necessary to present them, they may not be utilized. Let me help your staff learn the value of music in a young child's life along with the how and why of presenting music and movement with young children everyday, all year long. Gari Stein is the founder and director of Music For Little Folks: a music school in Ann Arbor Michigan for infants, toddlers, preschoolers and the grown-ups who love them. She also takes her program, based in Traditional Folk Music into local daycare homes, center, preschools, K-2nd Grade, conducts staff development for teachers, administrators, therapists, librarians & parents and leads interactive concerts and family programming. Educated in Child Development, Psychology and Dance, Gari has been working with young children & their families, therapists, social workers and educators since 1966. An enthusiastic clinician and grandmother, she is passionate about providing a rich musical environment for every child. Bringing a wealth of knowledge about child development and numerous activities to her trainings, Gari's interactive presentations and unique style also address the comfort level of the attendees. "You can have the best materials available, but if you aren't comfortable in presenting them, what good are they? Many professionals, regardless of their education or expertise, tell me that music is their weakest area." Gari helps participants find their singing voices and dancing feet, offers encouragement and instills confidence in their ability to incorporate music into their programs, everyday, all year long. A popular and inspiring keynote and clinician, Gari presents at national, state and regional conferences that include, NAEYC, AEYC, Early On, Great Start, Head Start, Infant Mental Health, Family Day Care, Young Authors, Michigan Reading and Michigan Library Associations. All children are born with the potential to be musical and seem to be pre-wired for music. Hearing has been shown to be the 2nd sense to develop in utero. Along with the motion and rhythms of the prenatal environment, infants enter the world ready to move. Music affects all aspects of total development and is part of a child's everyday life, even if they do not have planned music time. Early musical experiences are now considered to be intuitive and the current research is bursting with the positive impact on children's cognition, emotional well-being and social success. You will often hear children singing to themselves to self-comfort starting at a very young age. Music and movement for young children are indispensable teaching tools and should be part of every teacher and provider's training. But except in rare cases, they are not. Many professionals are often afraid to be musical, afraid of their singing voices or of losing control of the group. Classroom management is covered in depth. The search for materials can be frustrating and often educators rely on recorded music that may not be appropriate for young children. Much of the commercial music geared to our youngest population is too busy, too loud, too fast. 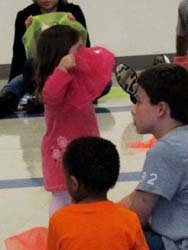 Educational workshops are often entertaining, but may be lacking in age appropriate developmental curriculum. A step-by-step approach is provided for teachers to easily incorporate a comprehensive musical program everyday, all year long, whether a non-musician or seasoned singer. Music is an art form and should be enjoyed for its aesthetic and enriching contribution. It can also positively affect learning, literacy and listening. Research supports the early years as an optimal time for developing ones musical potential. Studies tell us musical experiences positively affect cognition, as well as emotional well-being and social success. For some children music may be their only form of self-expression. Why appropriate musical experiences are so important in every early childhood program and what appropriate musical activities can do for young children, will also be covered in depth. By providing musical experiences everyday, staff can also benefit by reduction in stress, while being renewed, rejuvenated and re-energized with heightened efficiency and productivity. Based in the richness of Traditional Folk Music, user friendly and easy to learn, Gari's Sing With Me comprehensive curriculum, provides additional staff support. Music Matters. Music and movement lay the foundation for learning, social success, and emotional well being. Music is powerful. A rich musical environment can strengthen the child-adult bond, build community and create lifelong memories. Much more than singing and dancing happens at music time. Gari's enthusiasm will inspire the novice to seasoned singer, as she shares how music can be the teacher and caregiver's best friend. All presentations are research based and show how music and movement offer unique opportunities to nourish brain development, sharpen listening skills and help children self-regulate. Literacy experiences will be enhanced with new elements and dimension. From the following titles a keynote, workshop, seminar, evening activity or family program can be tailored to meet individual needs. Educational sessions include extensive handouts, short lecture segments with overhead and lots of fun, hands-on, easy to learn, interactive activities. Activities emphasize listening and include bounces, chants, continuous flow, creative & structured movement, finger plays, lullabies, melodies, percussion instruments, rhythmic & tonal patterns, rock & row, songs, steady beat, stories and more. Tips for group management, ideas for transitions, adult's comfort level, lots of movement and books to sing are a part of every presentation. KEYNOTE-What! Me Teach Music? Infants to 8s. Research studies will be cited, family anecdotes and classroom experiences will be shared, numerous hands-on ideas, emphasizing movement, will be presented. Toes will tap and spirits will be lifted. KEYNOTE-Just For You and Singing Games for the Children Too! We take care of children, but often forget about ourselves. Explore obstacles that may get in our way. Learn winning stress busters for you and listening activities to take back to the children. Renew and rejuvenate. Get ready for lots of laughter and too much fun. See Workshop Handouts for keynote outline. Infants & Toddlers: Babies are born seemingly pre-wired for music and learn through movement. Research supports the impact of movement on learning & all developmental domains. Explore methodology and materials for babies for everyday routines. Move with Mother Goose, props, instruments, books to sing & learn tips for group management for toddlers. Process Art for Toddlers to Kindergarten: Sample materials that focus on process vs. product. Embrace the mess & give children experiences to attach words to. Process art provides opportunities to explore their world, know wonder, discovery, ask questions, see how things work, make their own decisions. Impact learning, self-expression, creativity, risk taking, spatial reasoning & much more. Move to Learn, Play to Grow: Infants to Pre-Walkers A unique workshop that nurtures baby while addressing the needs of parents & caregivers. The focus is on observation, play, movement, touch and the body-brain connection. Relevant research is presented along with the importance of support & the sharing of resources with families. Promote healthy development & strong bonds in a warm, gentle, nurturing environment. Enjoy rhymes, tunes for everyday routines, massage, sheet rides, waltzes, folk dance, lullabies, hugs & more. 10 little fingers & 10 little toes: Finger Plays & More for Infants & Toddlers Provide mulit-sensory learning, encourage communication and touch, enhance bonding, strengthen fine & gross motor, hand-eye coordination & body awareness. Combine rhymes with everyday routines for infants, sample process art & lots of movement for toddlers while impacting language & literacy. Share laughter, hugs and more. Young children know all about the research supported movement-learning connection. Musical activities impact language, listening, taking turns, empathy, social competence, emotional well-being, even staff productivity and are instant stress busters. Sample a potpourri of activities, including books, for circle time, transitions or anytime. Leave equipped with enough material to last all year. But I Can't Sing A Note!!! Preschoolers or Preschool-Kindergarten... Strengthen learning, listening, literacy & child development with a research based & easy to learn curriculum from Hello to Goodbye. Rock-A-Bye Babies: Research supports the importance of movement as a foundation for learning. Music helps to build trust and security, strengthen the infant-caregiver bond and impacts self-regulation in toddlers. Frustrated by the lack of appropriate materials for your little ones? Explore daily routines with hugs for infants and lots of movement for toddlers. Rock-A-Bye Grandbaby: A very special workshop for grandparents & parents of infants to pre-crawlers. Help to enhance the bond & create lifelong memories while experiencing the joy of making music together. Learn simple activities that include dancing to Mozart, shaking maracas, tunes for daily routines, swaying with scarves, rocking to lullabies, sharing hugs, laughter and more. Moving & Learning ...PreK to 8s. Research supports how movement nourishes the brain, enriches language, learning, literacy, creativity and impacts all domains of development. Explore musical materials and methodology for transitions, group management, listening, singing games, books to sing, and more. Classical Moves: Supporting Learning & Listening for Tots to 8s. Classical music provides creative opportunities for moving, listening & learning. Learn how to introduce children to great works of music & sample unique, simple & engaging activities for use in transitions or anytime throughout your day. Ride horses, play baseball, walk dinosaurs, pound hammers and more. Get ready for too much fun. No singing required. Mommy, Daddy Sing With Me: Parent child enrichment for teachers and therapists. In our hurry up dot com world, a simple song can help slow things down & create a lifetime memory. Musical Morning to Bedtime Good Nights: Care giving, family and bedtime rituals influence the lives of young children. Routines can impact emotional well-being, self-regulation, and stability during times of stress, transitions and learning readiness. Explore the role that music and books can play to nurture family rituals and enhance these experiences. Put on Your Listening Ears: Our visual oriented society provides few opportunities for young children to develop critical listening skills necessary for learning & social success. Explore simple activities that will even get the babies listening. Songs, Stories & Singing Games: Enhance circle time or anytime. Support learning, listening, literacy & creativity. Capture attention & stimulate imaginations with simple activities through literature, music & movement. So Many Books-So Little Time: Books offer a unique opportunity to help young children focus, listen and learn. By incorporating props, song and movement, literacy experiences are enhanced with new elements and dimension. Sing A-Song & Dance A-long... Family Program: As part of conference evening program or special event, seasonal celebration, music enrichment for children, families, seniors, inter-generational, community sing and dance a-longs. Songs of the Seasons: As buds bloom, sun shines, leaves change or snow falls, children are filled with wonderment. Celebrate the seasons through music & stories. Just For You: Designed for conference or workshop attendees as an early morning warm up, after lunch, end of day wakeup or evening activity to help relieve stress, relax, rejuvenate and just have fun. Moving With Mother Goose: Nursery rhymes impact language and emergent literacy while contributing to your little ones social skills and emotional development. Explore unique activities incorporating literature, music and movement. Round In A Circle: Learn a years worth of circle games and dances providing learning opportunities for language development, spatial awareness and co-operation while nurturing social skills, self-confidence and joy. The More We Get Together: Our hurry up dot com world provides less time to share hugs and special moments. Explore materials to nurture relationships through music, play, books, art and more.